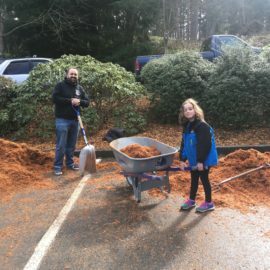 BWBS was stoked to partner up with Deep Playa to do some good at one of Lynnwood's biggest parks. 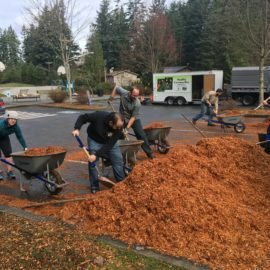 BWBS was stoked to partner up with Deep Playa to do some good at one of Lynnwood’s biggest parks. 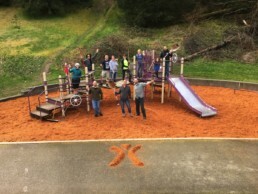 Our volunteers showed up early and carted a massive pile of bark to the playground and spread the new bark so that the kids playing on the playground would have a soft landing under the structure. It was officially tested and approved by Sasha! Normally, a project like this takes a few hours, but we had so many energy-filled volunteers that we were done and eating pizza by 1130am! Great job everyone! The Lynnwood Parks Dept. loved working with us and would happily have us back for more work.